Aquatic plants are an important part of the aquatic ecosystem, undertake a myriad of functions that remove nutrients from the water, release oxygen into the benthic layer and provide additional habitat for a range of aquatic organisms including daphnia. 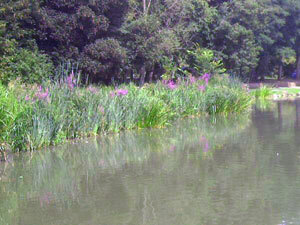 Most importantly aquatic plants have elaborate root structures that stabilise the banks and reduce erosion. Well established marginal plants substantially reduce erosion by forming a barrier between the water and the bank with the leaves absorbing and reducing the energy from waves. Aquatic planting improves the bio-diversity of a watercourse increasing the habitat values for a plethora of species and by improving the habitat for insects it is more attractive for birds and bats. 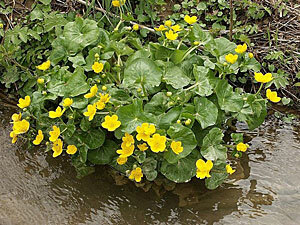 It is very important to ensure that the correct species are selected for each watercourse as many marginal plants are vigorous growers and can be considered invasive in the wrong location. We can assist with planting guides, schedules and where necessary planting mediums such as coir carpets, pallets and rolls. 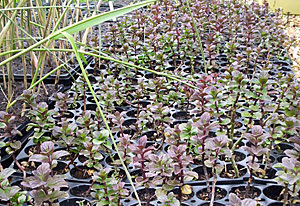 We offer a supply only or a supply and plant service and pride ourselves on sourcing our plants from a small number of bio-secure UK nurseries that grow only native plants of known provenance, of course for watercourses that are more contained we can also supply a selection of ornamental plants. Please contact us for an up to date plant menu, this will list many of the most common and popular aquatic plant species but please be assured we can supply almost any aquatic plant, tree, wildflower and grasses that you require.